Travelling on an unmarked gravel road through the Karoo, a seemingly endless herd of Angora goats forced us to stop the car, and allow the ancient farm scene unfolding before us to take us back in time... Whilst this is not a mountain pass, we have added this page in as a general interest item. This road does not form part of our national passes database. 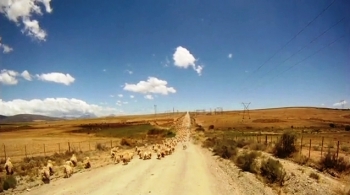 In this video clip, the entire herd of goats was controlled by the farmer in a 'bakkie' with single Border Collie ensuring there were no strays and at end of this 2 km long goat herd, two goat herders ensured they all entered a gate to a new pasture. This was the first road between George and Oudtshoorn. The Montagu Pass was opened in 1848, having taken 3 years to build by some 250 convicts at a cost of 36,000 Pounds Sterling. 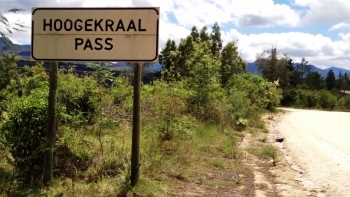 It lays claim to being the oldest, unaltered pass still in use in South Africa and covers 17,1 kms of magnificently scenic narrow, gravel road driving, ascending from the tiny hamlet of Herold, on the northern side of the Outeniqua Mountains up and over the summit and then all the way down to the outskirts of George. The road compresses 126 bends corners and curves into its length and gradients reach a maximum of 1:6. The road is suitable for all vehicles in fair weather, but please drive slowly and due to many sections being only single width (especially on the southern side) it might be necessary to reverse back to a wider point to allow passing oncoming traffic. The pass was built to replace the highly dangerous and extremely difficult Cradock Pass, which still exists today, but as a tough hiking trail. The pass was named after John Montagu, who was the colonial secretary of the Cape at the time. 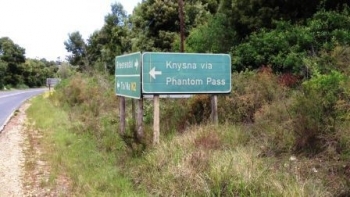 The mysteriously named Phantom Pass is the final pass on the Garden Route's string of "Seven Passes" between George and Knysna. 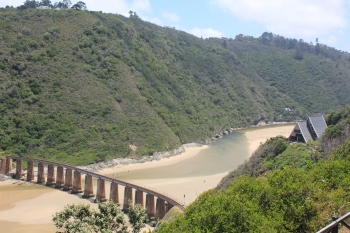 The 7,4 km of narrow, gravel road descends to the famously picturesque Knysna River Lagoon, and finds its end-point at the N2. The other six passes are listed at the bottom of this page for easy reference and access. 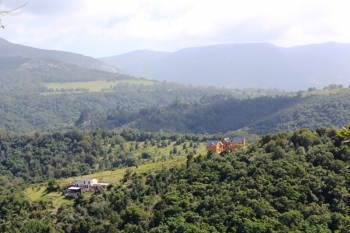 Lying 6th in the string of 'Seven Passes' between George and Knysna, the narrow, gravel Homtini Pass covers 5 km of wonderfully scenic driving, descending to the river from which it takes its name, and ascends up the eastern side to terminate at the Rheenendal Timber Mill. The name is apparently of Khoi origin and means either "mountain honey" or "difficult passage". 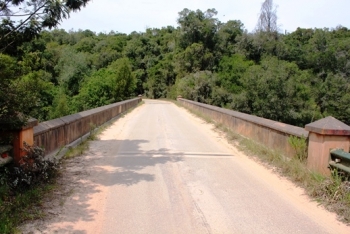 This pass is also sometimes known as the Goukamma River Pass. This is the biggest of the passes at 5 km and presents an altitude variance of 153m. You will be kept busy as the driver, as there are 45 bends, corners and curves of which there are 3 corners greater than 120 degrees and i extremely sharp hairpin. Of the passes on the 7 Passes Road that Thomas Bain built, this was the pass that presented him with the most difficult technical challenges and might well have been the point where his frustration levels boiled over which led to the now famous argument with his brother in law, Adam de Smidt, when the pair disagreed vehemently about the routing of the 7 Passes Road. The family argument eventually led to a 'no speak' scenario for the rest of their living years. Karatara Pass is found on the 'Seven Passes Road' immediately after the forestry village of the same name. Like all gravel road passes in rainy regions, the usual cautionary of 'slippery when wet' applies. This road is usually corrugated, which can cause loss of traction and control, particularly on corners with non 4x4 vehicles. This was one of the easier of the seven passes in terms of construction and technical difficulties. Like all of the preceding passes along the western approach, this pass has simialar vital statistics to the previous four passes, with a length of 2,6 km and a slightly smaller altitude variance of 62m. The vertical profile is once again the classic inverted shape of a pass that starts at a high point, then descneds down to a river crossing, only to rise back up again to virtually the same altitude as the starting point. The bridge is almost a carbon copy of the Hoogekraal bridge in its design and also carries two lanes of traffic. The Thomas Bain-built "Seven Passes" route between George and Knysna features the Hoogekraal Pass, covering 3 km of breathtakingly beautiful views along its narrow gravel road. It descends to and from the Hoogekraal River, and ends just before the Geelhoutsvlei Timber Mill - another Garden Route location, rooted in the history of the Knysna woodcutters. This pass ends west of the forestry village of Karatara. Like the Kaaimansgat, Silver River and Touw River passes, this pass has very similar characteristics in terms of distance and altitude variance as well as the classic inverted profile of a pass that descends to a river and rises back up the other side again. This is the first of 7 passes when driving from west to east which has a bridge wide enough to carry two lanes of traffic. 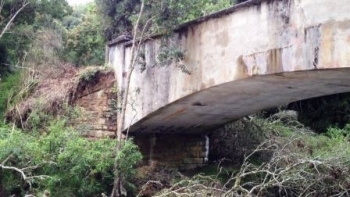 All of the bridges were made from concrete and stone and designed in the Victorian style of the early 1900's. It is only the steel bridge over the Touw River which is different. 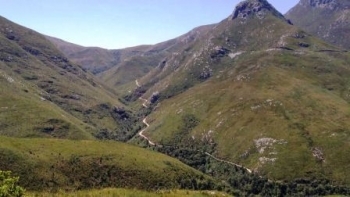 The Silver River Pass, is one of the Garden Route's 'Seven Passes', and covers 2,7 km of narrow, twisting tar-road driving through dense indigenous forests, descending to and from the Silver River starting where the Kaaimansgat Pass ends and finding its end at picturesque Wilderness Heights. The road is a national monument, and was built around 1882 by Adam de Smidt, who was Thomas Bain's Brother in law. The pass is the second of the official passes when travelling from west to east. Many people consider the Kaaimansgat and Silver River Passes to be one continious pass as they run seamlessly from the one into the other. It has similar vital statistics to the Kaaimansgat Pass in that it is almost the identical length and displays an altitude variance of 86m. The difference comes in the number of bends on the Silver River Pass. It has 30 bends, corners and curves compressed within it's fairly short length, which equates to an average of one corner every 90m! 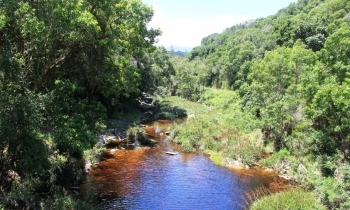 The historic "Seven Passes" route between George and Knysna includes 'Kaaimansgat' - a twisting, turning tarred road, close to the town of George, which traverses lushly indigenous forest to this area's famous 'black water' rivers. The road is old, narrow and the tarring is in sub-standard condition, but the beautiful indigenous forests through which it passes more than makes up for this minor inconvenience. The pass has an old bridge (a national monument) worth stopping at. Although the pass is fairly short at 2,8 km it has many sharp corners and drivers would be wise to keep their speed below 40 kph. The only safe place to stop as on either side of the bridge where there is limited parking for one or two vehicles. The Kaaiman's River Pass boasts several records. Although a fairly short pass in terms of distance, the curves are extremely sharp and the gradient is steep. 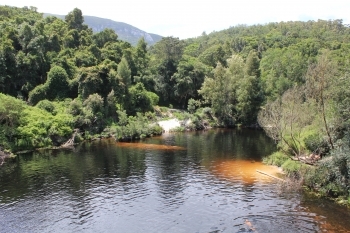 The pass connects George in the west with Wilderness in the east and traverses magnificent scenery with steep mountainsides, where the amber coloured waters of the Kaaimans River are crossed via the first curved bridge built in South Africa in 1952. The pass provides perfect views of the famous rail bridge at the mouth of the estuary and plays host to Dolphin Point - a perennial favourite with tourists offering 270 degree views including one of the best panoramas of Widerness beach. When commissioned in 1952 it ended a 70 year period where the Old Cape Road (including the 7 Passes) became much less used. "White's Road" meanders gently up Wilderness Heights - a quiet, country road where Welsh ponies on the local stud farm add to the almost English charm. This lovely drive is also popular with cyclists and walkers. The road has gentle gradients, seldom exceeding 1:12 and offers magnificent views of the Touw River Gorge, the estuary, Wilderness beach and village as well as Dolphin Point. The road is peppered with corners, many which are very sharp, but if you comply with the speed limit, all will be well. Please note that there is a hight restriction halfway along the pass, so don't go and drive this road ina high roof campervan, bus or truck. The lower 2 km close to the village is tarred, but the quality of the tarring is uneven and bumpy - to the point that you will probably find the gravel a more pleasant surface to drive on.